Who doesn’t love fried chicken? 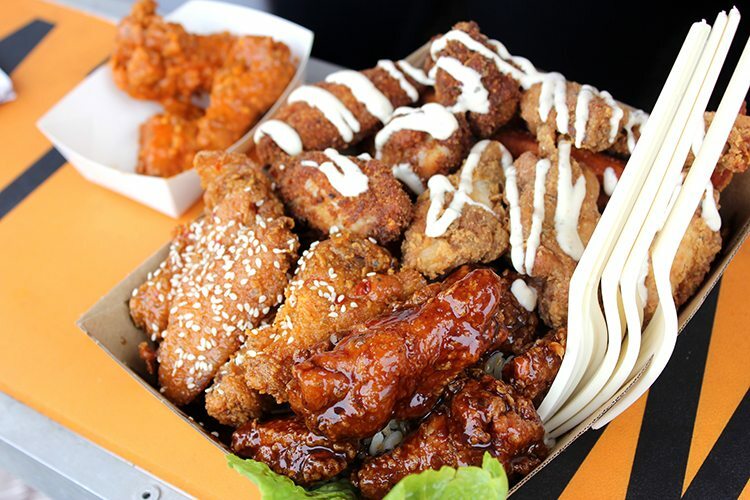 Get your dose at King of the Wings food truck, which offers American style fried deliciousness with five varieties of marinated chicken wings available. King Of The Wings is a concept that was created by husband and wife duo Dylan & Katrina Pires. After numerous trips to visit family in America & Canada in mid 2012, inspired by the chicken wing phenomenon in the US, they decided to start a chicken wing restaurant in Australia as the craze hadn’t begun here as yet. 2 years went into creating and testing sauces and researching into locations around Brisbane to start their bricks & mortar wing revolution. After much research and contemplating the commitment required to run a restaurant they decided it wasn’t for them as they already had 3 kids with 1 on the way and the demand on the family would be too much. In early 2014 the opportunity came up to buy a food truck. 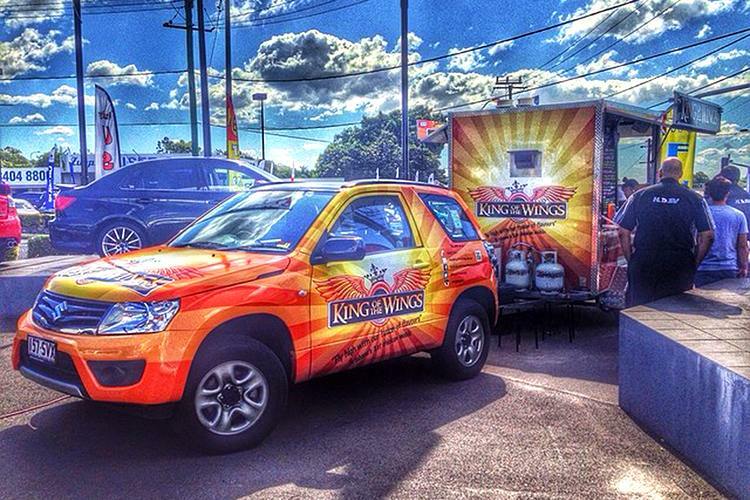 This was the perfect way to launch the King Of The Wings brand as it would allow Dylan & Katrina to work in their own time, around the family plus be able to venture across Brisbane without the risk of choosing the right set location. Within 6 weeks they had purchased a truck, designed the branding, finalised the menu, created a buzz through social media and launched on the streets of Brisbane. Having come from an events background, Dylan was able to use his marketing skills to create a hype around the brand which quickly drew a social media fan base in the thousands and Katrina having a management and hospitality background was able to setup the business end and make sure the customers left with an experience that would get Brisbane talking. 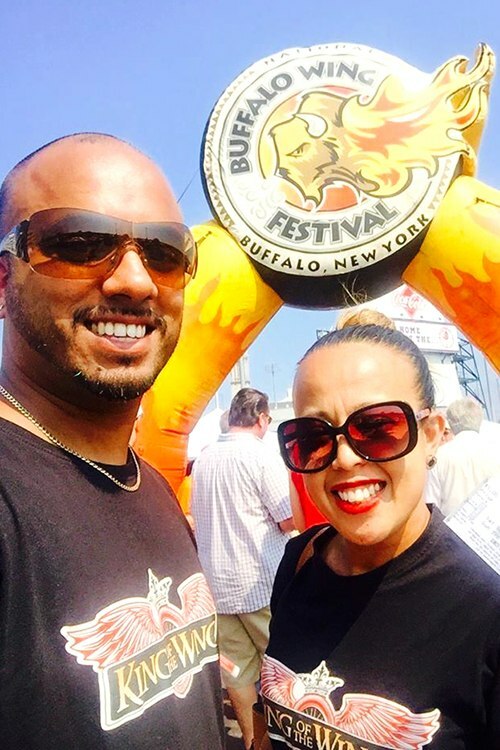 2 years on and the brand is thriving with almost 20,000 followers across their social media, an invite to represent Australia at the 2016 Buffalo Wing Festival in New York (USA) and their bigger second truck on the way. All our sauces and recipes are original and have been created with home made love. We have tried to make them different from any flavours you would find elsewhere which also means they are not so easy to duplicate. Our wings which have been rated as some of the best in Brisbane by the Courier Mail and even some of the best in Australia by Delicious Magazine. Where are the key spots people can find your truck? We are located at 4 permanent weekly locations each week from Monday to Thursday (including Kedron, Mt Gravatt, Teneriffe, and Milton), and roam to different locations and events from Friday to Sunday. Follow their Facebook and Instagram to find where the truck will appear next. What are a few of your favourite local businesses? We are big on supporting our local community and in turn network with small businesses for everything from our wings to our key ingredients and general supplies. But when it comes to enjoying the products and services of other small businesses, our favourites are always My Thai Restaurant, Pronto packaging, Advanced Pianos & Loyal Bakeware (all family owned and operated businesses). Have you been to King of the Wings? Tell us what you think and write a review.